This little organization of ladies had its beginning almost two years ago in the township of Dayton, La Salle County, Illinois. 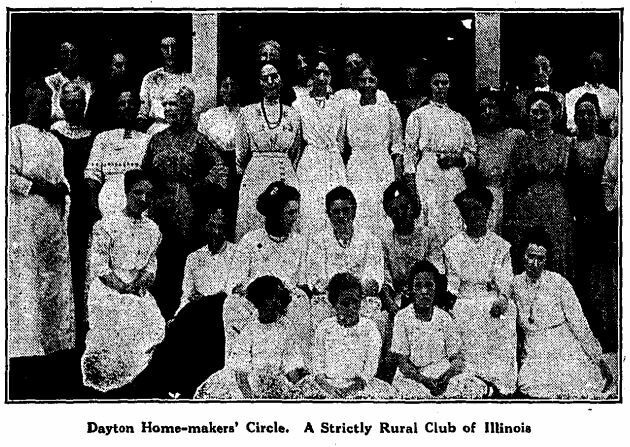 One member who loved the home and had read of such circles and clubs in other counties of the state from the state report of the Household Science Department, decided to start one in this town. After two meetings, where the subject was discussed thoroughly, we organized with a charter membership of twenty-three. We elected officers, prepared a brief constitution to meet our needs, decided to hold monthly meetings at various homes, to serve refreshments, (but these are limited, giving each hostess the opportunity of enjoying the afternoon as well as the guests). Our object is to be social, get acquainted with our neighbors, at the same time to derive the benefit from the exchange of ideas that may help us to have better homes and surroundings and all of the progressiveness to which we are entitled in our community. We include all ladies and girls of the township, and only require them to assist as far as possible in the way of programs, etc. Some afternoons we have “thimble” parties and all exchange ideas upon fancy work and sewing. At the June Circle meeting we had Miss Mabel Carney address us upon “Country Community Life,” and it was such an interesting afternoon we mean to have other speakers occasionally. This was on a stormy day, yet we had twenty-seven members and guests present. Many ladies drove six miles. We also have a social meeting in the evening during the winter, inviting the men. The one given last winter, at a fine country home, was in the nature of a “corn party,” the corn being used in the decorations and refreshments. Sixty-five were present and enjoyed a delightful evening. We had our first Fourth of July picnic this year, and the ladies turned this over to the men to arrange. It was a basket picnic, given at a neighbor’s home, and over one hundred people of the township were in attendance. We sat down to a table seventy-five feet in length and feasted on all the good things provided. After the dinner we had music, readings, races and an address, and altogether a good time, so we hope to make this an annual event. For the two years of our existence, the average monthly attendance has been twenty and missed only one month of the year when the regular meeting was postponed on account of the cold weather. We were criticised in the beginning, but that opposition has passed, and now every one looks forward to the second Thursday of the month to meet together, and the membership has grown to thirty-five, so we are progressing, even though slowly; yet all feel it was an effort worth while. We trust this article may induce other societies to start in other states. The officers are : Pres., Mildred Funk; 1st, 2nd, and 3rd V. Pres., Mesdames McClay, McGrath and Clark; Treas., Mrs. Henry Schmidt; Sec., Mary E. Strait. We have received most helpful suggestions from Mrs. Dunlap of Savoy, Mrs. McKeene, Miss Carney, and others, and hope to continue in the work.